Everyone knows that ants can carry things much larger than themselves—which leads me to wonder Just how strong are they? Research shows that ants, depending on the species, can lift things up to 50 times their own weight. All of us remember an ant carrying off a giant bug or moving something three times its own size. As a human it’s hard to fathom how they do it. Ants are also packed with protein. Some say all that muscle is the reason for the protein, and that’s some of it, but it’s the exoskeleton that provides the protein that puts the ant over the top as a food source. This critter with all its yummy power is just the right meal for many fish. They also lure many other critters to hunt them for food. Land predators like coyotes, foxes, and black bears are a few that come to mind. Most birds that fly the forests and fields depend on them; even reptiles lap them up at every opportunity. Over my years on the water as a fly fishing guide, ants drew my interest because fish almost never pass them up. Red ants, black Ants, flying ants, carpenter ants,… well you get the idea. 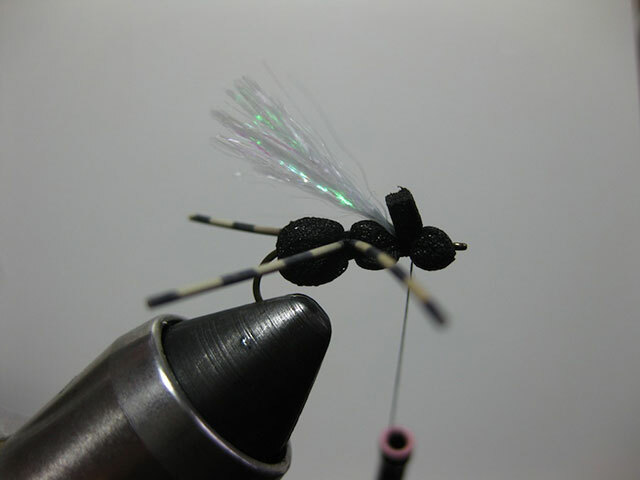 Ants also come in a wide range of sizes, matching patterns from those on a size 8 hook to those as small as a size 20. Last summer Kate and I were out on one of our favorite lakes fishing for bass. It was slow, to say the least. As evening approached so did a swarm of flying ants that hit the water. In a flurry it seemed as if every fish within 200 feet came rushing to the surface to gorge themselves with an ant meal. Now, this was well off the shoreline, in maybe 15 to 20 feet of water. We wondered how so many fish could become aware of this event so quickly. We changed to a rubber bug that I had in a fly box and caught several. But as soon as the event started it was over. Another story: Many years ago I was guiding a father and son on the Pine River. It was a beautiful, sunny summer day. A few fish had come to the fly but nothing of size. I noticed the ring of a rise under this giant white pine tree along a soft current seam. 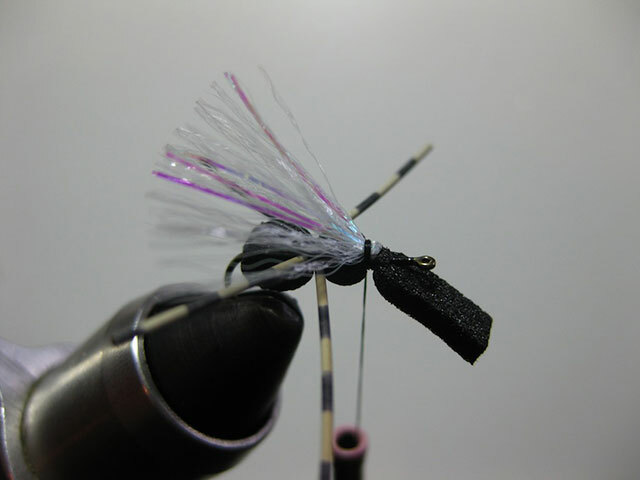 I changed our fly offering to a size 14 Black Ant and my client made just one cast and the ballgame was over. A dandy 16-inch brown trout was his prize. 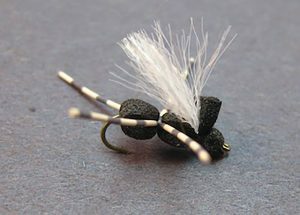 I have tied many ant patterns over the years but none as productive as the pattern I call the Pine Ant, which I’ll show you here. 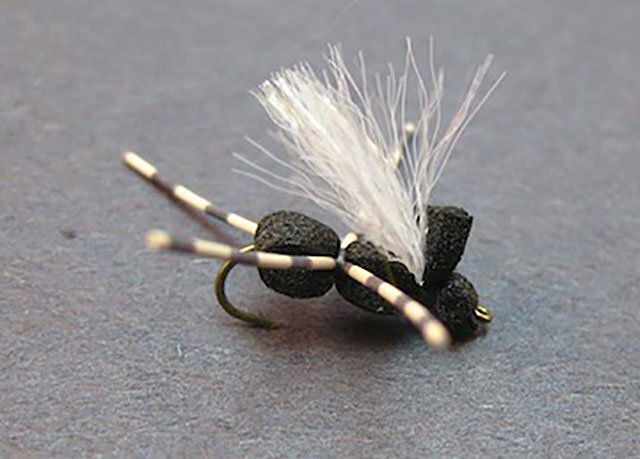 I named the fly after a river I guided on where ants are a favorite fish food. 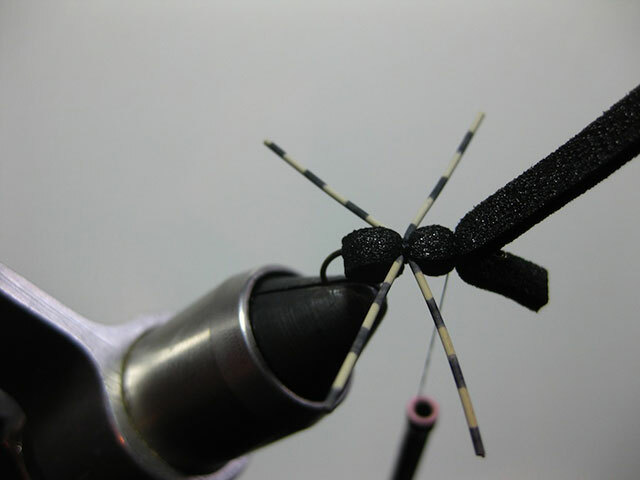 Here’s a photo and step-by-step tying instructions for tying my Pine Ant. Cut a 1/8 inch wide strip of 1mm or 2mm inch foam (depending on hook size). 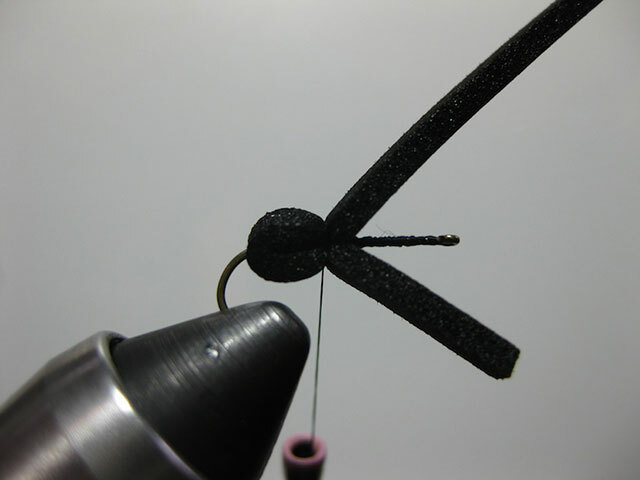 Poke a hole thru the foam and slide it on the hook shank as shown. 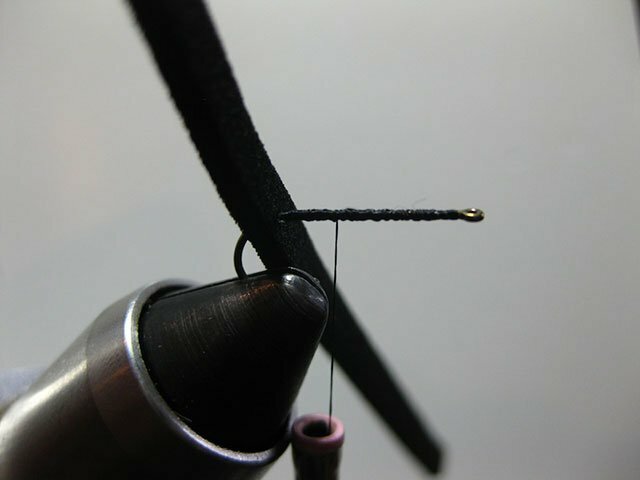 Dress the hook with 6/0 black thread. Fold both top and bottom of the foam strips forward to form the first ant bump as shown. Tie in rubber legs on each side as shown, size medium. Move thread forward and tie over both top and bottom to form second ant bump. Tie in wing material as shown. 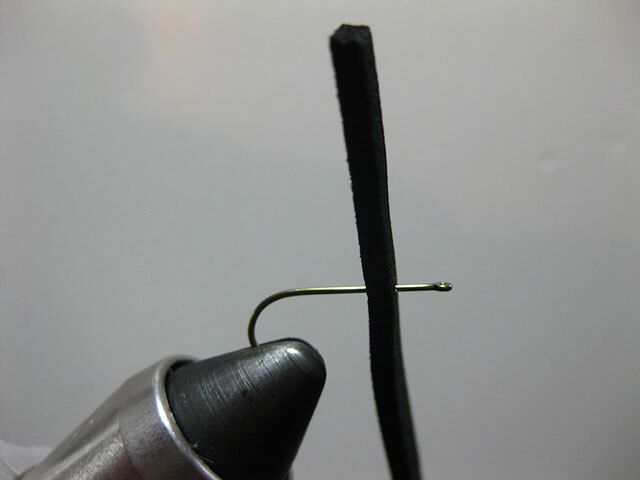 Poke a hole in the foam strip and fold back and thru hook eye and tie down as shown. Whip finish. 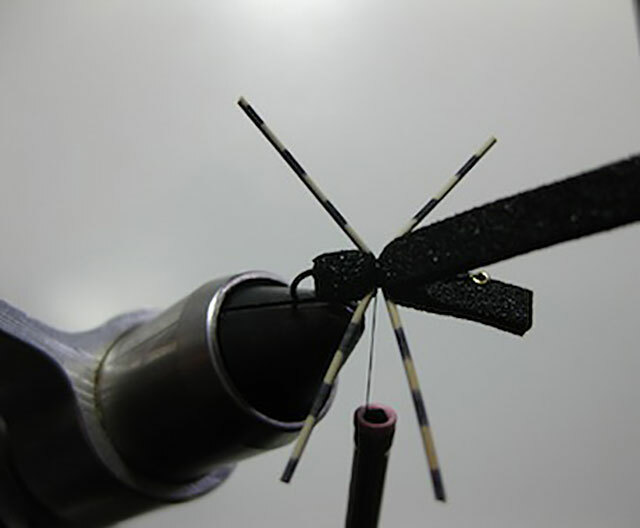 I use a drop of Flex Seal on each tie down area and the fly is ready to fish. This pattern and many others Ray has developed will be available in fly shops nationwide starting in August of this year. Spirit River of Oregon offers these patterns.